IMO, one of the things that make a huuuge difference to someone's face is eyeliner. I have monolids with naturally sleepy-looking eyes and eyeliner makes all the difference! I have prepared some photos to demonstrate the effectiveness of eyeliner in changing how your eyes look. The 'extra step' is always done on my right eye (left in photo). First is a simple straight line which makes your eyes look larger and rounder. Winged eyeliner wakes up droopy eyes. If you want to get the effect of droopy eyes instead, make sure your wing is directed downwards. 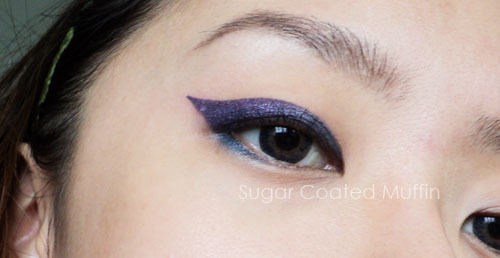 Join your eyeliner to the lower lashline and you'll get this. This seriously makes your eyes look bigger especially if you apply white eyeliner on your lower waterline. I usually use pencil or gel for the lower part so it's not so harsh looking and go halfway only. Some people draw all around their eyes and leave a sharp point at the tear duct. It supposedly has the best effect for eye enlargement but for me, it makes my eyes smaller! Don't understand why MUAs love to do this to me =_=" It does give a rather smoky, mysterious feel though. The 2nd and 3rd are my favs. It does look kinda weird here since it's taken from the front making the angle a lil weird. I absolutely love winging it out like the 3rd pic. Eyeliner is why my eyes look so HUGE in my Revlon post. You look really pretty. Your eyes look great w/eye liner i think! :) Some monolidded gals wear eyeliner but it's still hard to show unless they draw a thick line. where can i get colors gel eyeliner..its so pretty..
Really? I pick concealer LOL Thanks.. It's not perfect yet but definitely much better than how it used to be *flashback* Oh God Why..
YEA! Mine isn't thaaat bad but still requires quite a thick line to show up =/ Any thicker, I would have to resort to using kohl and smudging it.